Daytonian in Manhattan: The King of Greene Street -- Nos. 72-76 Greene St. The King of Greene Street -- Nos. 72-76 Greene St.
On May 27, 1872 Isaac F. Duckworth sold two properties on Greene Street, numbers 72 and 74, to Bostonian Gardner A. Colby for $72,000. Colby had purchased the “house and lot” at No. 76 Greene Street for $35,000 only a few days earlier. The negotiations involved in the transaction are tantalizing to imagine. Duckworth, a well-known architect, would soon design the “commercial palace” for Colby that replaced the old buildings. The 62-year old Gardner Colby was no stranger to the dry goods profession. In the 1850s he established Gardner Colby & Company in Boston; and during the Civil War filled several Government contracts for uniforms and other clothing. By now he was also President of the Wisconsin Central Railroad. Construction began on August 8, 1872 and was completed within nine months on April 30, 1873. Duckworth and Colby appear to have cut back the plans at some point. The original plans and sketches called for a two-story mansard roof; yet the building as it appears today is five stories and there is no record of removing the upper floors. Even without the mansard, Duckworth’s French Second Empire cast iron façade was a masterpiece. The complex design included free-standing Corinthian columns, balconies, and a projecting central bay. Pedestrians looking up would be greeted with fully-decorated undersides of the balconies. Fire broke out in the furrier business of S. Hirsche early on the morning of March 18, 1884. Damage to Hirsche’s stock was substantial—about $2,000---but the "fireproof" iron-fronted building escaped with only $700 in damages. Within a week Gardner Colby had commissioned architect and builder J. D. Miner make the repairs. Gardner Colby's monogram is emblazoned on the ground floor facade. Edward Haas had already had more than his share of trouble at the time. He had been partners with his brother, Louis H. Haas, until 1877. In January that year he was arrested by the Federal Government on fraud charges. In June 1878 he resumed business; but when the Government obtained a judgment against him for nearly $50,000, he turned the business over to his father-in-law. After Haas settled with the Government in January 1881 for $15,000 he resumed business under the name D. Haas’s Son. He had moved into the new Greene Street building, hoping for a new start. But a bizarre turn of events would crush his hopes. During the last week of June, 1884, he began losing his eyesight. Haas’s doctors advised him to give up the business and he quickly began liquidating. His condition quickly deteriorated and within two weeks he his sight was nearly gone and he had become paralyzed. On July 20, 1884 The New York Times reported that he “has been confined to his bed for two weeks past” and that “Mr. Haas had become completely blind and paralyzed, and would probably live only a little while longer.” It was a tragic end to a tumultuous life. Another cap manufacturer here was Solomon Simonson. When he refused to raise their pay, 60 workers went on strike in the first week of 1889. It was not a friendly walk-out. One particular employee, Adolph Gletzenstein, decided to remain on the job. He was visited at his home at No. 86 Ludlow Street by three strikers who tried to persuade him to join them. The balcony railings were, most likely, lost in the installation of the fire escapes. The hard conditions of apparel workers at the time were reflected in the factory inspection reports. In 1893, David Stern & Co., manufacturers of children’s and infants’ wear, employed 137 workers. Of these 25 were men, 85 were women, and the others were minors—six females and four males under 16 years old. Their average work week was 55.5 hours during the weekdays and 7.5 hours on Saturdays. A year earlier Stern & Schloss, infant wear manufacturers, moved in after their building at No. 32 Howard Street was gutted by fire. The company was founded by Aaron Stern and Joseph Schloss, and now included another partner, 30-year old bachelor J. Mortimer Dittman. Dittman visited his sister in Bayswater, Long Island on Saturday August 26, 1893. He headed back to his home at No. 75 West 52nd Street on the Long Island Railroad late that night. Just before midnight, as the train was approaching Long Island City, it ran full speed into a special train from Manhattan Beach. The Evening World called it an “awful wreck” and The Sun deemed it “the worst railroad disaster that ever occurred on Long Island.” Eleven persons were killed immediately, two died on the way to the hospital and two more died within days. Among them was Mortimer Dittman, who died on the scene before doctors could arrive. He was identified by a letter and a check in his coat pocket. Large garment factories continued to occupy the building. In 1896 M. Hemingway & Sons, “boxing and winding silks,” employed 67 women, eight of whom were under 21 years old; and David Stern & Co., makers of cloaks and suits, had a working staff of 117. In the first years of the 20th century John and James Dobson, manufacturers of “high pile fabrics and broad silks,” were here; as was Ernest and Herman Levy, ribbon manufacturers. In 1917 Frank E. Hatch Company took the store and basement. 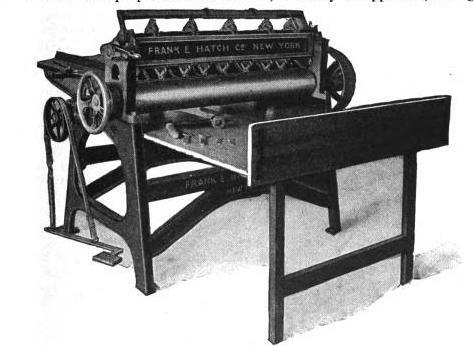 The firm invented, improved, manufactured and sold machinery related to the paper box industry. The Crescent Girdle Banding Co. moved into the building in January 1919 and would remain at least through 1922. It was in 1922 that Philip Nathan & Co., manufacturers of cotton underwear, took the third floor in the building. On the night of June 18, 1924 Nathan & Co.’s premises were broken into “by tools and explosives.” The thieves made off with $8,429.49 in merchandise. At approximately $117,000 in 2015 terms, it was a lot of underwear. By the time of the Nathan & Co. break-in, the apparel industry had already begun migrating uptown. Nathan & Co. was gone in 1934 when the Artistic Doll Corp. took over its former third floor location, as “additional space.” The trend of non-apparel firms continued in 1950 when Timbertone Decorative Co. took the fourth floor. The last quarter of the century saw Soho's discovery by artists who transformed old factory space to studio lofts, and ground floor stores into galleries and trendy shops. In 1983 Second Coming, a vintage clothing store opened at street level; and in 1985 Rentschler Gallery, the first of a series of art galleries opened.